Posted on November 20, 2015 by Barry V.
When I mentioned to a friend that I was heading to Skunknett River Wildlife Sanctuary, he reasonably asked if I expected to see any skunks! Actually “Skunknett” probably comes from an Algonquin Indian word meaning “a place to fish for eels” – which I’m sure it was in pre-colonial times. As I ready my gear for the trail, I’m serenaded by red-bellied woodpeckers and Carolina wrens. The Bog Cart Path is bordered by oaks and pitch pines draped with old man’s beard lichen. Near the end of the trail, and adjacent to the outflow of West Pond, is one small spot where you can step out onto the shoreline and get an unobstructed view of the pond. I quietly set-up my scope and train it on a dazzling drake wood duck floating among the stumps and lily pads. The bird is in perfect light that brings out the purples and greens of its iridescent head. I take a few quick photos thru the scope then adjust it to start drawing, but in the process, my tripod makes a squeak. Instantly, the bird’s head snaps in my direction, and it flushes and flies off. DARN! I notice that the nearby mallards remain undisturbed. Wild wood ducks are WARY! Later in the studio, I work from my rather poor photos to construct this composition. 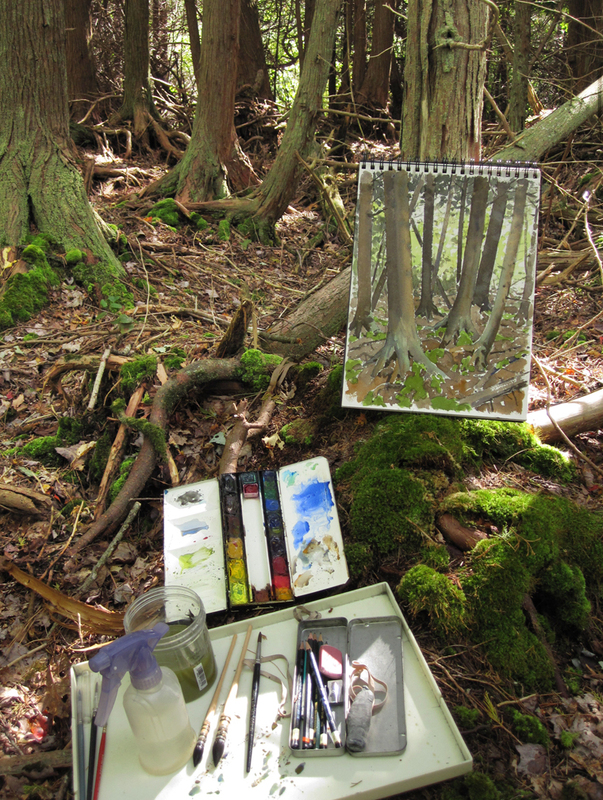 Working in the studio, removed from the actual subject in the field, can be liberating in many ways. I am often more imaginative and inventive in my studio work, and this painting is a case in point. I’ve deliberately pushed the colors and shapes to bring out the graphic patterns suggested by this subject. 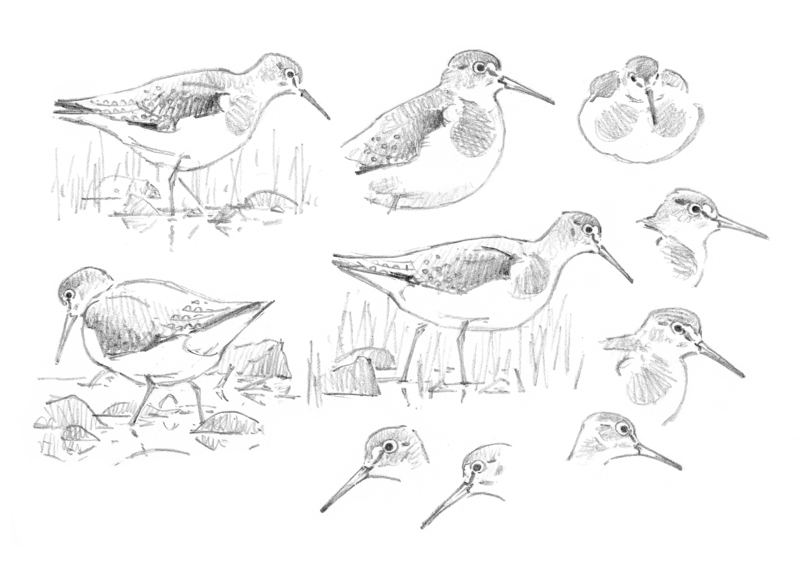 Closer to my end of the pond are at least three solitary sandpipers foraging in the grassy margins and on some exposed bars of mud. 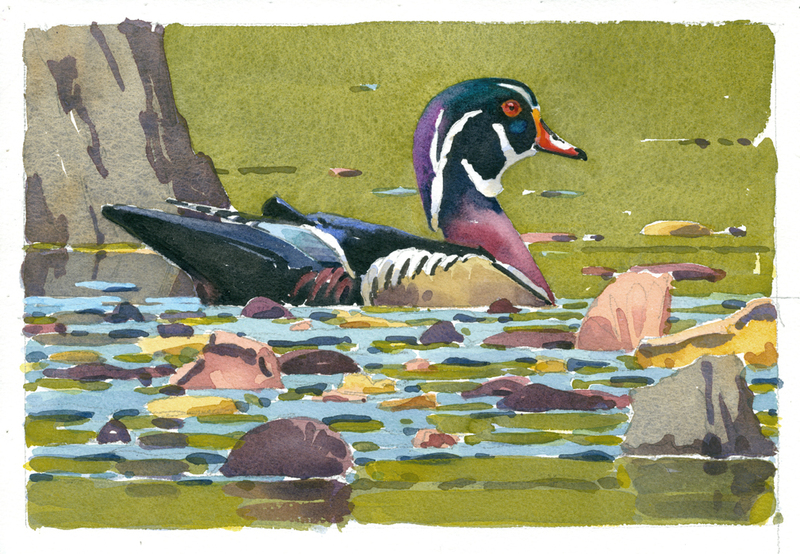 I enjoy sketching them for a time before proceeding down the West Circuit Trail and around the pond. At the far end of the pond, the trail passes by a modest stand of Atlantic White Cedars. 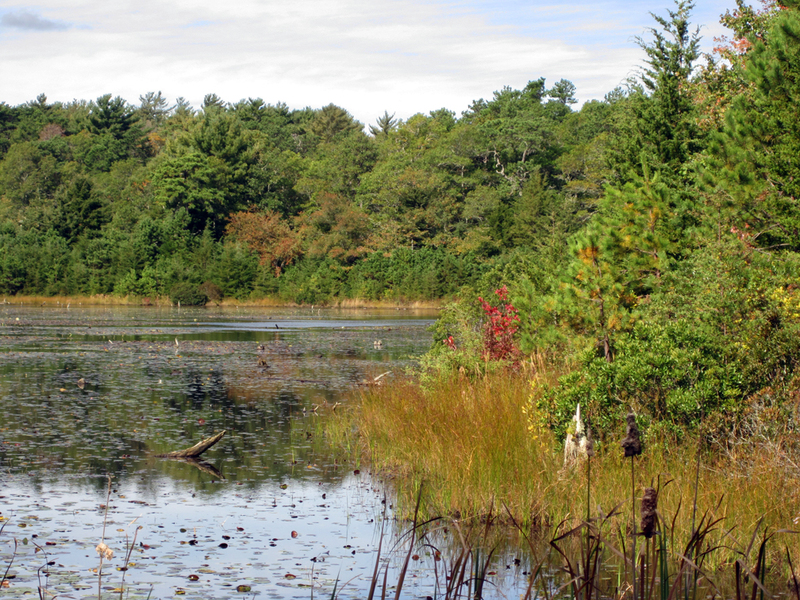 Cedar forests once covered huge tracts in the sandy coastal plains of Massachusetts, but these days only scattered remnants survive. Their desirability as lumber and the rich, peaty soils beneath them (ideal for conversion to commercial cranberry growing operations) led to widespread draining and clearing of these forests starting in the mid eighteenth century. Because of the small size of this grove, it lacks the gloomy aspect of larger cedar stands, and through the tightly packed trunks I can glimpse the brightness of the pond opening beyond. I set up my pack chair and settle in for some landscape work. 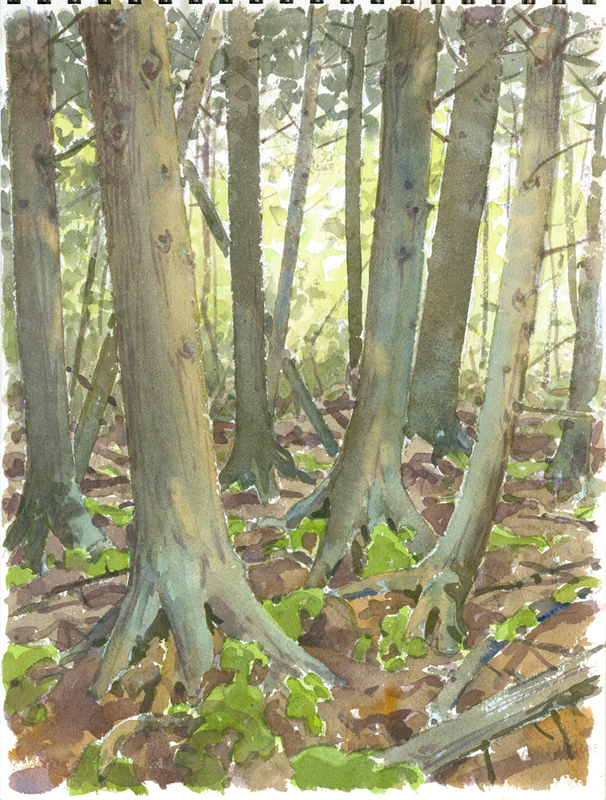 With my watercolors, I strive to capture the blue-green lichens coating the lower trunks and flaring roots of the cedars, and the dappled light on the trunks. Bright green moss growing over the roots adds a nice pattern in the foreground. This entry was posted in Artists, Barry Van Dusen Residency, Natural History, News, Wildlife Sanctuary and tagged atlantic white cedar, Barnstable, Barry Van Dusen, carolina wren, Landscape, red-bellied woodpeckers, sketch, Skunknett River Wildlife Sanctuary, solitary sandpiper, Watercolor, West pond, Wood duck on November 20, 2015 by Barry V..